Born in Vienna, the daughter of a concert pianist, the Austrian violinist Karin Adam studied at the Vienna Music Academy with Franz Samohyl. She made her first public performance with orchestra at the age of eight. After winning several competitions for young players she was awarded the "Mozart Interpretation Prize" by the Wiener Mozartgemeinde. After taking the First Prize in the "International Joseph Joachim Competition" in 1981 she has established as one of the leading violinists of her generation and has given concerts in all important music centres, such as Vienna, Salzburg, Berlin, London, Paris, Prag, Milano, Geneve, Madrid, Amsterdam, Edinburgh, New York, Tokyo, Sydney, Melbourne. Karin Adam performs with some of the world's leading orchestras, including the Vienna Symphony Orchestra, Orchestre de la Suisse Romande, Vienna Chamber Orchestra, Niederösterreichische Tonkünstler, Mozarteum Orchestra Salzburg, Berlin Staatskapelle, Stuttgart Philharmonic, Hamburg Symphony, Bremen Philharmonie, Essen Philharmonie, Saarländisches Staatsorchester, Württemberger Philharmonie Reutlingen, Basel Symphony, Prag Symphony, City of Birmingham Symphony Orchestra, Royal Philharmonic Orchestra Liverpool, Royal Scottish National Orchestra, Tivolis Symfonieorkester Kopenhagen, Tokyo Symphony and Tokyo Metropolitan Orchestra, Polish National Radio Symphony, Händel Festival Orchestra Washington, Orchestre Symphonique de la R.T.B.F. Bruxelles, Belgian Chamber Orchestra, RTL Sinfonie Orchester Luxemburg, Orquesta National de Espana., She plays with conductors such as Serge Baudo, Jiri Belohlavek, Christoph von Dohnanyi, Phillipe Entremont, Vladimir Fedosejev, Justus Frantz, Leopold Hager, Olaf Henzold, Arvid and Mariss Jansons, Fabio Luisi, Lord Yehudi Menuhin, David Shallon, Arild Remmereit, Stefan Vladar and Walter Weller. She also is a sought after chamber musician, and since 1985 she has performed in a duo with her sister, the pianist Doris Adam. She gives recitals and performs with orchestra at renowned music halls and festivals, such as the Concertgebouw Amsterdam, Carinthian Summer, Klangbogen Vienna, Bruckner Festival Linz, Wiener Festwochen, Europalia Brussels, Festival Schwetzingen, BBC Proms in London, Tsukuba International Music Festival, New York Carnegie Chamber Music Hall. Since 2008 she and her sister Doris Adam have established a concert series in Austria including recitals and chamber music performances with international musicians. 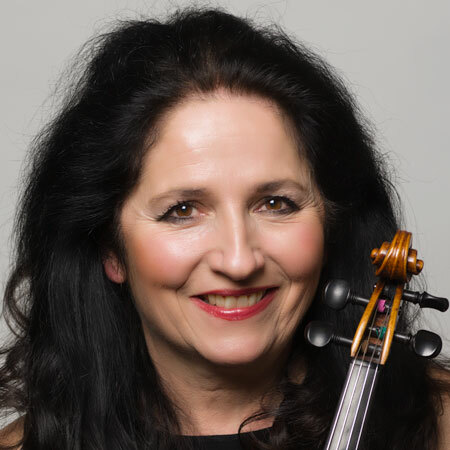 Karin Adam's recordings include the Violin Concertos by Brahms, Beethoven, Mendelssohn e-minor and the Double Concerto for violin and piano, Tchaikovsky and Sibelius. With Doris Adam she has recorded the Sonatas for violin and piano by Brahms, Beethoven, Dvořák, Faure, Franck, Grieg, Schubert, Strauß, as well as pieces by Kreisler. In 2009 Piano trios by Hans Gal have been released. Her latest recording includes Austrian contemporary pieces by R.Dünser and G.von Einem.